The best compliment a salesperson can get is “You really listened to me.” It’s more important to be interested in the client than it is to appearing interesting to them. Before Judy Hoberman, President of Selling in a Skirt, learned this pivotal lesson, she worked for a company that sold skirts. 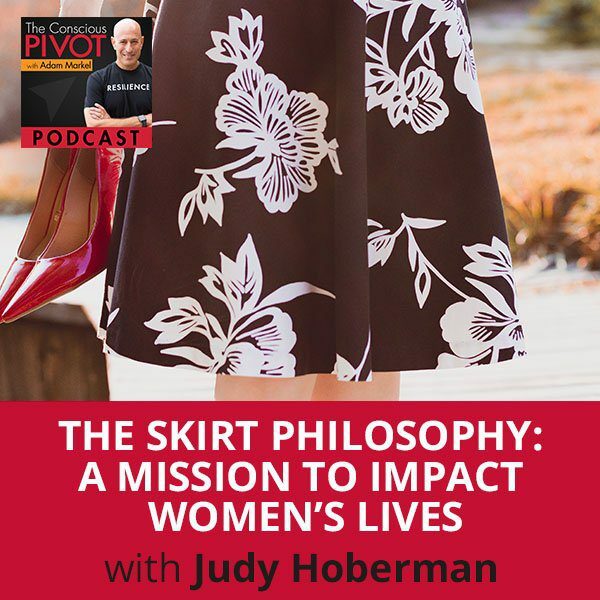 This bitter experience in her early career fueled Judy to create the Skirt Philosophy which helps empower women in the business world. Judy shares her secret to sales and why she is called the “Question Queen”. Welcome back to another episode of PIVOT Radio where we are working through some incredible changes; changes in business, changes in our personal lives. This concept of reinvention is really taking hold. I think it’s one of the skill sets that if I were wanting to embed some way of being in children, in kindergarteners at an early age, that way of being would be a way of innovating. Being able to change and not just change and manage change with a resistance or that feeling, “I can’t believe, I’ve got to do something different,” but rather that they would welcome change. It would be able to utilize change, alchemize it even. This discussion is really getting quite deep with a lot of people. I’ve got an incredible guest. Her name is Judy Hoberman. She’s the Executive Director of Walking on the Glass Floor Foundation. She’s also the President of Selling in a Skirt. We’ve got an incredible guest and incredible discussion about sales, about reinvention. We’re going to have a whole list of things that we’re going to talk about. Before I introduce our guest, I want to just remind us all how important this moment is. How sacred and even holy this moment is. Everywhere around the world as we take our next breath, everybody collectively, whatever you’re doing, whether you’re driving, you’re walking, you’re consuming this content at work, at home. Wherever you are, take a deep breath and be grateful in this moment for the fact that there are people everywhere who are taking their very last breath at this moment, and that makes this special. It can be cliché I suppose these days to be talking about being grateful, being in gratitude. I don’t mean anything trite by it. I think this is truly one of these moments where every chance we get to be in our hearts and acknowledge the sacredness. How special it is that we are alive, that we are awake in this moment, that we’re breathing in. That gives us access to things that we cannot even comprehend that it’s special. I feel blessed to be with you. Blessed to be able to bring on an incredible guest on the show and share with you her incredible gifts, the knowledge that she’s gained and the amazing thing she’s done with her life. Her name is Judy Hoberman. She is the Executive Director of the Walking on the Glass Floor Foundation. President of Selling in a Skirt, which is a company she created. She’s been in sales for 30 years. Gained incredible knowledge and she’s got an incredible sense of humor that you’ll detect very quickly about gender differences in the workplace. She’s created a suite of programs that take the negativity out of selling. People who have a lot of negative mindset around. There a lot of negative programming when it comes to selling, so we’re going to get to hear from Judy about that. She’s also authored three business books including Selling in a Skirt, Famous Isn’t Enough and Pure Wealth. I love those titles. She hosts a weekly radio show on iHeart radio called Selling in a Skirt and is featured as the gender expert on Fox News Radio. Judy has appeared on CNN, ABC, CBS and has contributed articles to numerous publications and journals. In 2016, she gave a very well-received TEDx Talk about the impacts of pre-judging people. Judy’s mission is to help women live her S.K.I.R.T. Philosophy, which I’ll quickly summarize S.K.I.R.T as in Standing out, Keys to success, Inspiration, Results and Time management, all while having fun. We know that her mission is to impact women’s lives, but I’m going to say right out of the gate, this is not just about women. All you men out there and I too have gained so much knowledge from my experience in coming to know Judy and learning from her. She’s a wonderful font of knowledge, great knowledge for all of us. It’s not just for women. It’s for men as well. Who knows? Maybe men are okay to wear a skirt at least figurative. Judy, welcome to the show. Thank you so much. I’m excited to be here. Yes, men learn a lot from this as well as women learn a lot. Yes, we’re here together. Would you supplement that introduction by sharing a little bit about yourself? What I’m really curious about in our community they’ll love this. What are you jazzed up about? What are you passionate about in your life these days? Walk us through. If I missed anything in the introduction that you feel is important that people know about you, please feel free to do so. I am jazzed up about a lot of things, but right this moment I am in the process of launching another book. The reason I’m so jazzed up about it is because it’s actually going to help women in leadership find out what their inherent feminine qualities are, the soft skills. The men that champion them, how they can help them getting to that level. A lot of times we hear that women don’t get promoted and women aren’t in the C-Suite. I’m going to help you do that. The part that I’m really jazzed up about is I’m going to be giving back a good portion of the proceeds to companies and foundations. Women that can’t afford to have a coach or have a mentor and be able to give them scholarships, so they can be a part of the community that will help get women into these leadership positions. I’m very excited about that. I’m just declaring this out loud, we have a foundation. We love it. It’s a big part of what drives us to do what we do. I’m just declaring this intention. I want people to want to have and be able to create their own foundation. It is an incredible gift to be able to do that. With all the jobs that are disappearing and will continue to disappear, traditional jobs over the course of the next ten years, being an entrepreneur, being in your own business and being able to have where with all to have a foundation, the desire and be able to execute on that would be phenomenal. I’m going to put that intention out there. Do you support that, Judy? I totally support that. It’s interesting because to give a company money, it’s not that easy just to hand somebody money anymore. I want to make sure that it’s done the right way. You look at some of the charities out there and a good portion of the money doesn’t go to the charity. It goes to overhead. We don’t want to do that. We want to be able to give so the person that really needs it is going to receive it. I think that’s important to remember when you’re looking at different charities and foundations. Skirt Philosophy: The more I was able to help people, the better I felt about what I was doing. You’ve had a very interesting life. Would you share a little bit about that interesting life? Then let’s get into some of the juicy pivot stories. Our folks are used to that. We get some really wild stuff that gets shared. What’s amazing is that in all of those crazy experiences of our lives, there’s this incredible learning. This one thing that’s consistent throughout, which is this growth trajectory. This amazing human capacity to bounce back from setbacks, bounced back or pivot as we say, into a place where they have higher consciousness. They’ve learned something amazing. They’ve been able to dial in their dream a bit more, have greater service in the world. Then also prosper in ways that include money but aren’t exclusively about money. Would you catch us up a little bit? I started my career in commercial roofing. I was the only female that would actually be climbing up a ladder to sell commercial roofing. In a skirt by the way? Absolutely, I know I was hired because I was a female. What they told me, it was in the ‘70s, they said, “You had to dress for the part. You couldn’t just show up in jeans, overalls or whatever.” The way that they told me was, “You’re going to climb up in a ladder in a skirt but not to worry because we’re going to have somebody underneath you just in case you fall.” You’re in your twenties and you’re thinking, “This sounds pretty cool,” until it actually happens. Underneath you, you have this whole group of men that are applauding. That’s how I started my career of being the only female in a company that totally was not empowering women. What’s going on right now is pretty amazing. I would love it if you would actually share some thoughts on this. You know my background, married to my college sweetheart and we have three gorgeous young women. Just the thought that they would have to deal with some of the crap that you’re talking about and that had been acceptable behavior on the part of men in the workplace as to women is shocking. It’s shocking on one level that it could be tolerated for so long and acceptable as it has been until recent time. I don’t know if acceptable is the right word. I think it’s fear. I think a lot of it is fear. You’re talking about very powerful people. It could be male or female that are doing inappropriate things or saying things. You’re talking about power. A lot of times as the person that’s the recipient of that power, you back off because they can do things to hurt your career. They can do things to hurt you personally. They just can. I can remember not in the commercial roofing. When I was in insurance, I had somebody that used to say the most disgusting things to me. You have to remember most of the things I’ve done, I’m an independent contractor, so there was no HR. It was the Wild, Wild West. I remember him saying things to me and I said to him, “Would you like it if somebody said this to your daughter?” He goes, “You’re not my daughter.” I said, “I’m someone’s daughter,” and it didn’t matter. I will tell you that you have to be smart about things. You do tell people and they do what they want with it or not. I remember I had to be intelligent. I remember the language that he’d used. I went to a bookstore and I bought an anatomy coloring book. At lunchtime, I walked into his office and I said, “Can I talk to you?” He said, “Are you going to close the door?” I’m like, “No, I’m not closing the door.” I handed him the coloring book and I said, “At least get the terms correct,” and I walked out the door. He never bothered me again. He realized that I did have a brain as much as anything else that he wanted, so he just left me alone. It happens to more people than you can imagine. I think that’s the part that’s so shocking is however secretive or people who’ve been in fear to call people out or to have their lives impacted by someone else who wanted to seek retribution or there would be retaliation. I was a lawyer for eighteen years and I used to handle discrimination cases. I never handled a gender discrimination case. It was always race. Obviously the gender discrimination laws were there and people were handling them. I just never in a million years really believed it was this prevalent. That’s the part that I think is shocking to me. You think about it, so many things have changed in 20, 30, 50 years, but in the scheme of how long we’ve been around. How long we’ve been on this planet. The evolution of the human species, 20 years, 50 years is a speck in time that things like this were somehow tolerated or looked the other way. People look the other way or whatever only a short while ago is just amazing to me. While you and I are talking, there’s somebody else that’s being called out right now and this one’s being called out, now there are 27 people. It’s hard. It’s not just the sexual part of it. A lot of it is just the emotional part. They’re not talking about the emotional part right now. They’re only talking about the behavior. I’m telling you, this man put me up against a wall with a car and said if I tell anyone he’ll hurt my children. You tell me what would you do? You’d keep your mouth closed. That’s what you do. That’s the bottom line, you just wouldn’t say anything. That’s what I’m saying, a lot of it is fear. You’re on ladder and that’s where you start in the roofing business. Where do you go from there? What happens? Do you fall off the ladder? No, I never fell off the ladder. It got to the point where it was not the right culture for me obviously. I did get into insurance and I stayed there for a couple of decades. I did very well in insurance. The reason I did well was because I knew as a single mom, my one and only job was to protect my family. When I went out to talk to your family or someone else’s family, I knew my job was to protect your family. Sometimes when you’re in a sales position, you want to quit every other minute. Either it’s not working or it’s not making money. Then I thought, “If I don’t see your family, what if somebody else doesn’t find you? How could I possibly not be there and protect your family? Today I won’t quit.”It kept going like that and I just kept protecting families. I did really well in it because I changed my mindset. An entrepreneur is not meant to be a solopreneur with nobody else helping them. You need somebody. I like to refer to this context and it’s not my term. It’s something I learned. In the process of going from lawyering to this training space of personal development, business development, we learn how to create context for certain things. You created a context around what you were selling so that you had a very big why. You understood the why behind it. That’s what drove you. Is that part of it? Did you end up not teaching anyone? Are you kidding? Who are we talking about? I didn’t listen as I best started building my team, that’s what we all did. Then they brought me in to build all their training because my people were profitable and staying. Our term for that is the heart of enrollment. I want to learn more about what’s that process like? Is there a process to that selling that you had learned? Are you willing to share it with others? Sure. What I would do is I became the question queen. People would say to me, “You have more questions.” Every time you walk in the room they roll their eyes thinking, “How much more could she possibly ask?” I needed to know everything. I needed to know so I can present to you what I had to offer. When I would go and see somebody, I would be very interested in them not interesting to them. I would ask lots of open-ended questions. If I got you to speak to me, you would give me your why. There’s nothing more powerful than your why. You know that, I know that. Instead of saying, “Do you want insurance?” I would say, “Tell me why it’s important for you to have this policy in place?” They would tell me that they wanted it and they will tell me how much, but they also told me their why. That was how I would sell. When people ask me, “What’s the secret of sales?” I say, “Stop selling. Just stop selling. Have a conversation with people. Get to know them. Become the resource. Don’t just disappear.” There are so many different pieces of it but it was more about this part, about meeting somebody not doing it over the phone, getting to build a relationship. When you ask questions, you’re interested in someone. You’re willing to listen and give your time. What more valuable asset do you have than your time? You don’t. There’s a trick because people say, “I don’t listen well.” Listening is a tough thing to really conquer. I tell everybody, “When I sit down with you, the first thing I’ll say is, ’Do you mind if I take notes?’ When you’re taking notes you have to listen.” People that are bad listeners, all of a sudden they become really in tune to what you’re saying. That was the other thing that I did. I would sit down, I would take notes and then when you’d say, “What do you think? What do you got for me?” I would say, “This was important to you.” They will think, “She really listened.” Best, best compliment a salesperson can get is, “You really listened to me.” That’s what I did. I want to circle back to that because you’ve given our audience a hack. If you’ve learned nothing else, you’ve learned something really profound right now is that in a sales conversation, be interested, meaning you’re there to develop relationships. That’s first, develop the relationship. How do you do that? You ask questions. Thirdly, you listen. If you already have that story in your head that you’re not a great listener, then your hack is to ask permission to take notes and then take notes. You can’t speak or make it about you when you’re taking notes about them. Nobody cares about you. You haven’t gotten that trust yet. They don’t care about you and you have to understand that. Don’t take that personally. Once you show you’re interested instead of being interesting, then all of a sudden they’re going to ask you a question, “Tell me about you. What’s up with you?” The other part is you don’t ask questions about them hoping they’re going to ask back. It’s giving without thinking of receiving anything. I’m telling you when you sit and you take notes, you can’t help but listen. The questions are open-ended. Don’t say, “Do you want?” “Yes, no, maybe so.” Ask a question that makes them speak. Who do we like to talk about the most? Ourselves. That’s how it works. Skirt Philosophy: You need to have other people that can support you and you have to learn how to ask for help. Isn’t that the main premise in Dale Carnegie’s book, How to Win Friends & Influence People? Help them to talk about themselves, not that difficult. I’m interested in knowing more about you. I know our people are as well. Where do you go from there? You’re at this insurance company, you’re killing it. I know the backstory so I’m just going to say, “It doesn’t stay. You’re killing it, but at a certain point it’s killing you.” What does that look like? I was the anomaly because the field loved me because I came from them. Here I am, the only person with that experience. The culture was not for me. I lasted two years. I built all their training. It was wonderful being in the field, but I quit. When you quit, you give up everything, like severance. Here I am, 55 years old, jumped ship, literally jumped. I didn’t have anything to jump to. I decided to start my company. I’m thinking to myself, “If I was starting right now, what would I want?” I would want somebody to help me guide me through the journey. I’m not asking anybody to do the work for me but at least say, “This is what it’s going to look like,” I didn’t have that. I thought I’m going to do that and I’m going to concentrate on women. Are you talking about what we might call a mentor? The knife went in, the salt was around it and we dug in deep. What she said to me was, “You’re doing the same thing you’ve always done. How are you going to meet somebody? How are you going to be useful to anybody? How are you going to be useful to yourself when all you do is work? You’re working so hard.” She didn’t mean anything malicious by it. It was my biggest a-ha moment where there was a huge pivot right then and there. That second I knew I had to change. I started putting guidelines for myself and structure around what I was doing so I could enjoy my new company I was building, but also get to know me again. That was huge. Every time I tell that story, I feel it in my throat like I have to gulp because I remember how I felt when she said it. What part of yourself, Judy, do you think you’d lost along the way? I lost my personality. I lost my inner child. I lost all of that. The only thing that was left was this, “You’ve got to do this. You’ve got to do that. You’ve got to get this going.” I went back to being seven that I had to be perfect. Everything had to be perfect. I went right back to things that are not the right things to go back to. If you could be perfect, you could be loved. You come to this point, you’re 55 and you choose to start a new business as an entrepreneur. What are some of the great pivot lessons, the mistakes that turned into something that either helped you to turn the mistake around and be successful or at least it helped you to not make the same mistake again? What are some of those big nuggets as a new entrepreneur? There’s so much. Being an entrepreneur is exhausting. It’s never ending. It’s almost like there’s no boundaries between your work, your home or your personal life. The technology is changing so rapidly. Our culture is in flux. There’s so much disruption, almost in a minute by minute basis. Being an entrepreneur is not easy and yet it is without a doubt the road to freedom. The road to great freedoms that most employees don’t know about. I want you to share the ugly underside of it. I want you to also let us know what’s in it for people because it’s a bit of a cow patty on in some ways. I think that one of the biggest lessons obviously was about don’t lose yourself. When you can become an entrepreneur, you’re willing to work 100 hours a week for yourself but you weren’t willing to work 40 hours for somebody else. Does that even make sense? You’re not making any money yet and you left a cushy job. I have to say I’ve never looked backwards. Never looked back because I needed to be this way. Can you reconcile that just a little bit? There’s something really meaty in that idea that people don’t want or will be grudged working for someone else for 40 hours. The statistics, the Harris Polls and other polls say that 55% to 60% of people are in jobs that they are so unhappy. That they’re actively looking for other work. 80% are in jobs that they just know is not there. It’s not their dream, it’s not their passion or what have you. How do you reconcile that misery with the idea that giving it up means working twice as hard potentially? You have to decide what you want to do, who you want to do it with, and is there a need? First of all, you have to decide the businesses that you’re going to do and why the heck are you going to do this? It’s not just saying, “I bake really good cookies, so now I’m going to be the next Mrs. Fields,” that’s not what it is. You have to decide what you want to do, who you want to do it with, and is there a need? Sometimes you have a great idea but nobody needs it. You can’t create a problem. You have to find out if there is a problem. When I was working corporate, and I only worked corporate for two years in my entire life, I was making a ton of money. I worked a bunch of hours but you didn’t get paid extra. It wasn’t like you got bonused out, you didn’t make commission. This is what it was. For me it was a little strange doing that anyway, getting paid and not getting paid what I’m worth. Even though I made a lot of money. The other part of it is why are you doing something that you detest when you could do something that you love? You have to decide, “How many hours a week am I going to work?” As an entrepreneur, when you work from home, there’s no stopping you. If you have a spouse or a significant other, they could say, “Back up a little bit,” but I didn’t have that. I had nobody to give me that balance. I had nobody. It was me. I want to work, I’m going to work, who’s going to stop me? We do that because we’re trying to create this passionate business. Once you have it running, don’t think it’s running up all the time because it runs backwards. You got this thing going on, so it’s high and it’s low, “How am I going to pay my bills?” It’s exhausting. I did it because I felt like I was going to be sick if I stayed where I was physically. I was popping Excedrin all day long and I just couldn’t do it. If the culture was different, I might have stayed a little longer, but the culture was horrible. I worked with mean girls. That’s how it works. I knew physically I needed to get out of there. Beyond even that, I knew that I was creating something that I could support a group of people that really needed my help. A lot of times women don’t ask for help. If I could offer it, they didn’t really have to ask for it, it would be a different thing. That was the other lesson that I learned also was about you have to ask for help. You can’t do this by yourself. An entrepreneur is not meant to be a solopreneur with nobody else helping them. You need somebody. For technology, I have to ask other people. I don’t do technology. I do enough to be dangerous but you have to have somebody. If you’re doing something where you have to do marketing materials, what if you’re not a graphic artist? If you’re going to learn a program, you still have to learn it. You need to have other people that can support you and you have to learn how to ask for help. That’s a hard one, especially women. What are some of the fruits of being an entrepreneur? I’m sure there’s a bunch of people who are in jobs they don’t love and can really resonate. They know my story as well. I gave up profession, title, money and all that kind of thing to pursue doing something that would feel good in my heart, feel good in my soul. I certainly wanted the money. I certainly wanted the success as well. What’s on the other side of the exhaustion from your experience? When somebody looks at you and says, “You changed my life,” is there anything better than that? “I was ready to quit and then you showed up.”There’s nothing better than when somebody says to you, “You changed everything for me.” You can’t put a price tag on that. The first time somebody said that to me, I just burst into tears as I feel like I’m going to do right now. That’s what it is. I did a virtual mastermind not too long ago and there was a woman on screen that said to me that because she read my book, she didn’t know me, I didn’t know her, but I happened to show up one day. Skirt Philosophy: There’s nothing better than when somebody says to you, “You changed everything for me.” You can’t put a price tag on that. Pivoting, mindset-wise, is an ongoing process for you? Judy, what are the rituals? Do you have rituals that help you to get grounded or reset so you can get back to what’s true, what you’ve learned? Your experience is true about life, about yourself, about the world? I think when we’re stressed, the normal stresses of life, of business in particular, sometimes the tape will rewind and what you’ll hear in your mind is this little voice that might be your dad or might be yourself or it could be even the society as a whole. It’s saying to you somehow, “You’re not really good enough. By the way, this thing you just screwed up or this thing that went wrong, it’s actually proof of all that crap that was told to you when you were younger.”Those kinds of conversations show up in your head. I had this happened, we were delivering one of our trainings. We have a beautiful sales and speaker training that we call The Heart Enrollment. The first day we had this beautiful day. It was incredible. I was drained. Second day, same thing, it’s a lot of heavy lifting. It’s a lot of holding space for people while they go through process and you’re leading and all of that. End of day two, I didn’t feel good. I didn’t feel good about myself, I didn’t feel good about what we were doing. Somehow it just felt off to me. Then sure enough, got a little bit of sleep that night. Woke up the next morning, had this release. I was in the shower, praying, thinking, just connecting and realized something and had one of those moments. Then had this unbelievable third day of this program, just watching life-changing things happening. Things like you say you can’t describe but when you’ve seen them, you’ve experienced it. You can never go back to anything that’s less intentional. It’s less of a thousand-fold value in the world. Regardless of what that is, you just can’t dial it in on someone else’s dime. Which sometimes is what a job feels like. Somebody is paying you and you’re just doing it. It’s not who you are. It’s not your life. It’s not what you’re here on the planet to do. All that happens. Then on lunch that day thinking to myself, “How often do I have to lose faith, regain faith, lose faith, regain faith, lose faith, have something, show me yet again what it’s all about?”It’s that back and forth of, “I get it, I don’t get it, I get it, I don’t get it,” which is painful on some level and yet it’s somehow part of the process. You get too comfortable. Have you ever seen a speaker or a trainer that believes their own press and they get up and they think, “I’m just awesome and whatever,” but not awesome in an awesome way. Awesome in an obnoxious way. If we never get this back and forth inner conflict, how do we stay humble? How do we stay where people want to be around us? I know for a fact there are people I know them and I don’t want to be around them. They’re just so cocky and self-promoting. That’s not me. That’s not you. I could tell you it’s not you and I have never met you in person. I know for a fact that’s not you. You want to be somebody that’s authentic. I want to be somebody that’s authentic. I want people to like me because it’s me, not because I’m someone else. If we don’t get this inner conflict and it grounds us a little, we become obnoxious. If we don’t get this inner conflict and it grounds us a little, we become obnoxious. Is there a specific thing you do during the day or certain time of the day that we might call a ritual or a master habit that is able to get you back to yourself? Just to do something that helps you in your business. If it’s productivity habit or it’s a personal reset type of a habit that you’ve created. What is that? What does that look like? My husband and I went to a conference and one of the things that we started doing was journaling. Every night we journal, and in the journal we talk about what kind of success did you have today? What are you grateful for? What makes you happy? It could be that, “Today I got a great haircut.” It could be anything. We both do it every single night and then we share it. It really brings you back to a different space. We would talk about the day and whatever but it’s very different when you’re writing this down as part of your journal. It also encourages you to do something else. For me, that’s become a new ritual for us. I’m very grateful that we do that. I really am. It’s taking our communication to a different level. That’s my ritual now. Every night we journal and we talk about successes, the gratitude because you have to say thank you. I don’t care who you’re saying thank you to. It could be the computer screen if you want, but say, “Thank you.” Then what you’re working on to either reach your dreams, be happy or whatever. That’s what we do. What I love most about that particular ritual is that you share it with each other. I think that this gratitude habit, creating a gratitude ritual or habit during different times a day is powerful. Knowing that you’re going to do that before you go to bed at night and that’s the last thought or part of the last thoughts that you cultivate before sleep. Before you get into that subconscious state. The fact that you’ve got somebody that you’re sharing it with. If you’ve got that significant other, this is a wonderful ritual to try on. I am inspired to do this. My wife and I, Randi and I, we each have our rituals. What I’m just noticing in this moment is that we get together through what we call this thing we call basecamp for our relationships. Whether it’s doing crosswords, walking the dogs or other things. That particular gratitude, that particular thing is not something we typically share with each other. I just think it’s wonderful to do that before you go to bed at night. I’m sure that gratitude is going to include each other. We do it at meals and things like that. I love this idea of doing it at night. I’m going to try that on for size. I didn’t think we were going to continue it, really honestly. I fell asleep. I’ve never seen a program that’s on from 9:00 to 10:00. I’ve never seen a complete program because I always fall asleep. Even last night, I woke up and said, “I’m so tired. I’ve got to go to sleep.” Then I looked and I said, “We have to do our journal.” We sat down and we did our journals. It was good. Some of the gratitude is like, “I’m grateful because he grilled dinner tonight.” That’s what it is. It’s all about positivity as opposed to, “I have to do this.” It just changes. It’s like flipping the switch. It’s pivoting. Judy, you’re delicious. I love your energy, love having you be a part of our community. I know you do a lot of work with women. You mentor and coach them. You’ve got a system for sales increasing performance there too. Where is it people can find more information about you? My website is SellingInASkirt.com. You can find me either at Selling In a Skirt or Judy Hoberman. I’m all over social media. I’m very consistent, so I do post every single day. My email is Judy@SellingInASkirt.com. It’s been a blast. I love having you. Thank you so much. This has been really special for me. Thank you. Thank you for being vulnerable. I really appreciate that too. We’re ending this particular episode and as always, I want to bring us back to where we began, which was with gratitude and this breath, how beautiful this breath is. I feel blessed to be here with all of you and be present in this moment. I want to recommend that you wake up tomorrow. That everybody gets to wake up. In fact, I wave my magic wand, it’s done. We all get to wake up because that is not something that’s guaranteed to any of us. It’s in that moment that you realize you are waking up regardless of what the day looks like. Whether it’s a cloudy day outside, it’s cold, it’s warm. You’re excited about your life and your business or you’re not. I’ve spent many years not waking up, putting my feet on the floor and not feeling excited about what I was going to be doing for the day. We can acknowledge in that moment that regardless of how we might feel that we have an important assignment to do. That’s why we’ve been given another day. There’s just no two ways about it. It’s not by chance that we get another day. Step one, wake up. Step two, be grateful for something in that moment. Even if it’s just the breath, there’s a lot to be grateful for as we all know. We all will admit when asked that question for sure. Third, if you’re inclined to do it for the next 21 days starting tomorrow. I know a lot of you are already into day ten or day twenty or day 80, day 100th, whatever it is, declare, “I love my life, I love my life, I love my life.”That becomes your intention for the day. That’s the seed that you plant in the soil. The very beginning of your day. Watch how it is that you germinate that seed in so many, so many ways. Judy, again thank you for being with us. Excited to be able to share you with our community. Thanks again. Have a beautiful rest of your day. Ciao for now and leave a comment. Let us know how you feel about the show. If you haven’t already subscribed, subscribe. Also check in at the Start My PIVOT Community on Facebook. You can get there also by StartMyPivot.com. Get our six-question kick start guide to see whether or not you’re in a pivot. Whether a pivot is on its way or whether you’re in the middle of one right now. Then therefore what resources are available to you to support what you’re up to. Anyway, lots of love. Ciao for now. Judy’s experience includes being an award winning Accomplished Corporate Training Director with extensive experience in training, course development and project management. She is a true entrepreneur at heart with experience both in the Self-Employed and Corporate arenas. She was personally selected by the President and CEO of a large Insurance Company, to move to Dallas to bring her talent in training to the Corporate office and share it with over 100 offices in 44 states showing over 300 agents how to break the mystery of the sales process into manageable pieces and create an authentic selling system. She is working with Insurance companies helping with their diversity and women’s initiatives in the areas of recruiting, training, coaching and mentoring. She was awarded the Character and Integrity Award from the field for her distinct and significant contribution to the field agents’ success. With experience as being one of the female pioneers in the insurance world as well as being an expert in gender communication, she was asked to speak on the Main Platform at LAMP, an Insurance Conference, about recruiting women into the industry. She has also been the Keynote Speaker at the Women’s breakfast at LAMP and led numerous breakout sessions on “Why Can’t A Woman Be More Like A Man”. She is also the author of “Selling In A Skirt”, “Famous Isn’t Enough” and “Pure Wealth”, business books for Professional Women, Sales Executives and Entrepreneurs.